Epoxy floor finishing is a trending design nowadays because it significantly enhances the appearance and functionality of your garage. However, you can have lasting regrets if you do it incorrectly or use the wrong products for the finishing. Make sure that the contractor is using the right products to work on your epoxy floor finishing. However, you may be required to acid etch the floor especially if you are dealing with garage doors. Some of these floors may be very old or having grease or oil stains. Acid etching will thoroughly clean the surface and make it more rough and porous and hence ready to accept a coat of paint. However, you can ask the individual who is behind the paint desk whether you need to do this or not. There are several advantages that come with epoxy floor finishing. However, you cannot get all these benefits unless you make the right applications. Palm Beach Concrete Underlayment Services has the right professionals who can handle this task. The first advantage of epoxy floor finishing is that it improves the overall appearance of your surface. You will also have the ability to wash up any spilled substances with a lot of ease. Epoxy floor finishing is the best wat to protect your concrete and give your surfaces an awesome look. The main challenge with epoxy floor finishing is that it can make the floor very slippery especially when wet. To make it worse, even adding a non-slip substance may not correct this problem. The other trick is that you can ruin the appearance and usefulness of your floor if the application is not done correctly. Some examples are marks, garage hot tire pickup, and chipping. Epoxy remains to be one of the best choices especially when looking for garage door finishes. Epoxy floor finishing serve you quite well especially when it comes to hot tire pickup. The finish will not pull off from the floor and stick on the hot tires after driving for long. Therefore, you are not going to experience such messes. Some epoxy packages come with non-additives and Palm Beach Concrete Underlayment Services can advice you on the best. You can also choose any color that will enhance the overall look of your home. The most important thing is to follow in the directions that are on the box to make the applications. However, Palm Beach Concrete Underlayment Services can help you in fixing your floor. You can use any of the epoxy products on the interior or exterior concrete surfaces if you want to pressure wash the surface or at the minimum carefully clean it off. However, you should make sure that the floor is clean of any debris and dust and dry before you make the application. The next step is to mix the activator using an electric mixer or paint paddle. Then, pour your mixture in a paint tray and use a junk brush to cut in the area that you wish to paint. Make the paint applications in even strokes while working on a small area t a time. make sure you also use the ½ inch or 3/8 inch nap roller cover. In case you are dealing with several blocks, paint one at a time and be careful not to tie yourself in a corner. After painting on the product, you can then add the desired color flecks when the paint is still wet. Most of the people I have seen like the look that these flecks bring to the floor. The most important part is to ensure that you purchase a clear sealant that is normally applied on the overtop epoxy. If you avoid using this glaze coating, the bottom layer of your epoxy may end up chipping. It may also rip out the flecks. You can also paint on the clear coat as you did on the bottom epoxy layer. Some kits also come with the non-slip additive that you can add on the topcoat or epoxy coat of the glaze. This will help you to avoid the slipping and you can also buy the non-slip kits separately. It will take you a few days before you drive on a freshly painted surface. 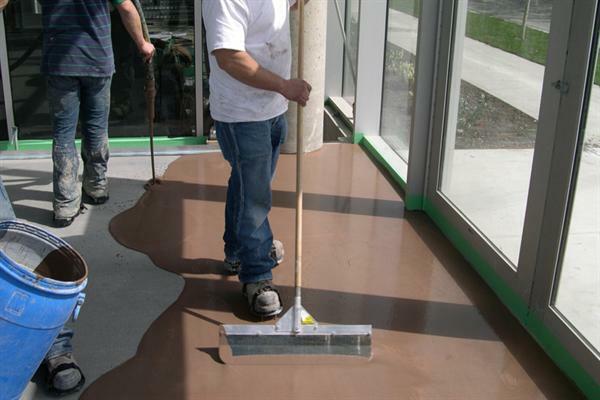 Palm Beach Concrete Underlayment Services will help you to get the best epoxy floor finishing.